This incredible life-size art work was made entirely out of rubbish shaped into a dead blue whale. 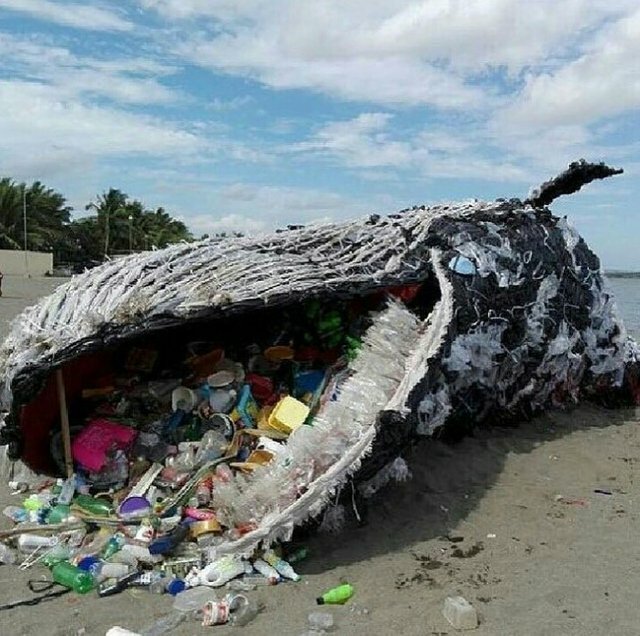 It was constructed by Phillipines Greenpeace and is a grim reminder of what we are doing to this planet..
Al principio, cuando observe la ballena, creí en verdad que era una ballena verdadera, me dio impotencia y dolor al verla muerta en la playa; pero luego, me di cuenta que es solo una obra de arte de tamaño natural hecha con basura plástica. Felicitaciones al constructor Phillipines Greenpeace y al fotografo por crear esta sombría ilusión óptica. Very nice ... thank you! Upvoted you. It makes me furious to think what we do to our oceans and our environment in general. I know I'm a part of the problem, even though I live inland. Other than myself not polluting, I feel powerless over this problem. Same thing with in steemit. . . The more junk or spam can make a big whale feed the bait wrong, so that is worth the attention / original article so untouched by the big whale. . Really in pity. The @OriginalWorks bot has determined this post by @easytyga to be original material and upvoted it! This post has received a 1.22 % upvote from @buildawhale thanks to: @easytyga. Send at least 0.50 SBD to @buildawhale with a post link in the memo field for a portion of the next vote. You Are An Excellent Steemian. This post has received a 50.00 % upvote from @steemthat Return the favor and SteemThat Person Back: @easytyga. . So sad but a good way to get some people who never think about this problem to see the enormity of it. I like there way of conveying the message. I will be sure to resteem when done writing this to help increase awareness of this problem. Thank you for bringing light to this story again. This post has received a 2.47 % upvote from thanks to: @easytyga. @easytyga take part of the @minnowhelper's 50 SBD Contest. For more information, click here!